FOR LEASE - Older Appaloosa Gelding NEW HOME FOUND!!! 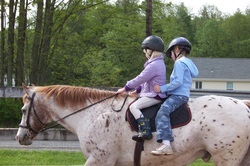 Kind and gentle older Appaloosa gelding available for a care lease situation... safe and appropriate for children learning to ride, a confidence builder for a timid teen or lady rider. Gets along well with other horses. Ties, clips, loads and hauls great. Good on trails and in the arena. Full care boarding available where he is currently stabled in the NW Ferndale area or he can go to your barn with the owners pre-approval. Please contact Stephanie at 360.815.6844 or Robbie at 360.319.1138 for more information.